Substance, surface, and inflatable fish. Though Water, a devised piece by physical theatre company Filter and the director David Farr, was first seen on stage in 2007, it feels just as relevant today in the wake of a number of climate change plays, including the National’s recent multi-authored Greeland. Not that Water is a climate change play in the conventional sense. The subject is dealt with, but on a human and intimate level. Water tells two stories that intertwine and echo one another while remaining separate. In the first, Graham, unsociable by nature, awkward and somewhat Eeyore-ish, travels to Canada for his estranged father’s funeral; there he meets his younger half-brother and discovers some unexpected truths about the man his father really was. In the second thread, Claudia, a hard-working political adviser, strives to create some kind of global accord on climate change while in the process jeopardising her relationship with her boyfriend, Joe, a cave diver with his eyes set on the world record. Claudia and Graham both end up in Vancouver, in a glossy waterfront hotel, but they never meet. Sound plays an integral part in the production and Filter’s co-founder, the composer Tim Philips, creates an atmospheric sonic collage of sound effects and music, punctuated by the thud-thud of a heart-beat, the thwack of a squash ball, and cumulating in the unnerving roar of water as a lone man descends into uncharted darkness. Though the spectre of global warming and the threat of rising sea levels background the narrative, they are only one aspect of a production in which the human drama is pushed to the fore. The focus remains fully on these two individuals, both at crisis points in their lives. 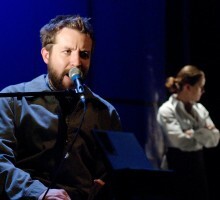 Filter’s Oliver Dimsdale, Ferdy Roberts and Victoria Moseley share all the roles between themselves, switching nimbly between characters; the backstage crew are also occasionally roped in when a scene requires it and Philips is always visible at the side of the stage, so that the technical process of creating the sound effects is incorporated into the fabric of the production. This perception of transparency is a trait that runs through much of Filter’s work – the cast saunter on stage before the show officially ‘starts’ and are introduced by name – but it’s complementary rather than intrusive, a balance is always maintained. Enough room has been left for characters to evolve. Roberts has perhaps the hardest task in this regard, playing both the dour, unsettled Graham and his more ebullient father, a successful marine biologist and an early cautionary voice about the consequences of global warming; he manages to differentiate between the two men while subtly underlining the paternal connection. Moseley elegantly sidesteps cliché as Claudia, a woman who lives for her work, who is driven and determined to a point that borders on self-sabotage. Dimsdale’s two characters, Graham’s younger brother and Claudia’s boyfriend, are less shaded in comparison though this is more to do with the shape the play takes than his capabilities. It’s true that if one were to strip away the sound effects, the numerous inventive touches and the inflatable fish, then the story might feel anaemic in places; one could also justifiably argue that the techniques used here have been used more dynamically elsewhere, but both observations would be churlish. Substance and surface walk hand in hand in this production, they perform an intricate dance, they form a mutually rewarding partnership. Natasha founded Exeunt with Daniel B. Yates in 2011 and remains responsible for the overall editorial management of the site. Since March 2015, she's been joint lead critic for The Stage, along with Mark Shenton. She has also contributed to Time Out, the Guardian online, The Space, and The Independent, and she reviews books for The Observer. An occasional writer of fiction, one of her stories was shortlisted for the 2010 Bristol Short Story Prize.